Aston Martin has unveiled their new customer racing Vantage GT3 and GT4. The competition machines will make their first public appearance at the top endurance race in the world; the 24 Hours of Le Mans. The Aston Martin Vantage GT3 will make its racing debut this weekend in the Michelin Aston Martin Racing Le Mans Festival. Both costumer racing machines are the polar opposite of the British performance car maker’s road cars. Where those are luxurious GT cruisers, the GT3 and GT4 are stripped no-nonsense motorsport machines. Having said that, they are still gorgeous to behold. Here are all the details we know at this time. 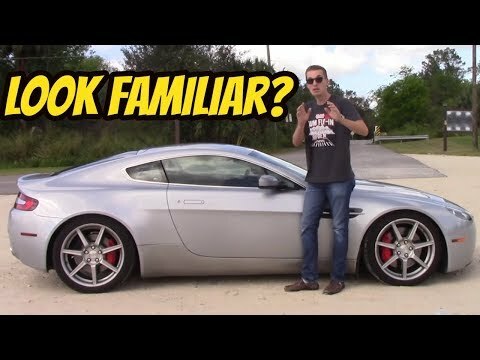 Should You Buy A Cheap Aston Martin V8 Vantage? The mid-2000’s (around 2006 and 2007) Aston Martin V8 Vantage are now very affordable. Ok, they aren’t as low as $5,000 like the early 986 Porsche Boxster, but they are less than $50,000. Considering that when new one of these examples of a V8 Vantage would cost you about $130,000 and you have a special car for not a lot of money. In fact if you do some hunting and purchase a car with a bit higher mileage, we’ve found a number of good examples with under 50,000 miles on them for about $35,000. That’s right, for the price of a loaded Honda Accord you can drive a modern Aston Martin that most people will think is new. Aston Martin will debut their all-new Vantage at the 88th Geneva International Motor Show. The show is one of the biggest auto shows in the world and has a history of significant debuts. One of the cars that will receive the most interest is the Aston Martin Vantage. The twin-turbocharged V8 powered sports car will give both the media and public a first chance to get a closer look at the new Vantage. The press has not yet been able to experience the Vantage, so they will be clamoring to get a good look at the performance machine. For 2016 Aston Martin is aiming for a couple of World Endurance Championship (WEC) titles. The British luxury performance car maker will have two entries in the GTE Pro class and one entry in the GTE Am class. The cars will compete in the series which includes the legendary 24 Hours of Le Mans endurance race. Many may already know it, but in WEC Aston Martin has managed a class victory 23 times. That number is more than any other manufacture that has competed in the series. It is hard to believe that we are approaching the Goodwood Featival of Speed already. The UK event that celebrates fast motor vehicles will start next week on June 22nd. For the festival Aston Martin will have quite a few interesting cars, including a UK debut and a world-first public showing. Goodwood is a fitting venue for the British luxury performance car maker to show the incredible products that they produce. They make some of the best GT cars ever. This plus their car’s being featured in many James Bond films has made them one of the most desirable automotive nameplates in the world. To find out more about the Aston Martins that will be at the event click past the jump (or scroll down if you came directly to the full article).